Yesterday, mummy went shopping at Tesco. Tesco is quite far away from our house. 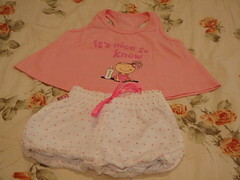 However, every time Elizabeth’s “Mamy Poko Pants” finished, mummy will surely look for it at Tesco. I am sure everyone knows that some of the things in Tesco are really cheap. “Mamy Poko Pants” is one of it. The usual price for “Mamy Poko” at Guardian, Giant, Pakson, Cold Storage or shall I said most of the convenient stores, supermarkets or hypermarkets is about RM 21.90 for the XL size 12 pieces pack. But, Tesco is only selling at RM 16.40 each. What a big difference, isn’t it? Thus, mummy will always buy “Mamy Poko Pants” from Tesco. Mummy will buy at least 4 packs at one time. Sometimes, mummy even buy up to 6 packs. Anyway, don’t buy the large pack. Most of the time, the large pack is much expensive than the small pack at Tesco. Granny just cut my hair few days ago. I guess Elizabeth must be so scared when granny trying to cut her hair. She seems know that scissors can cut. So, She stood quietly like freezing while granny placed the scissors by her hair. Clever, aye? Mummy just don’t have to worry that she might struggle and get herself injured next time when mummy send her to the barber. 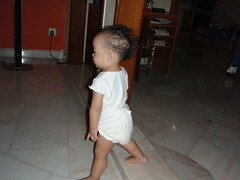 However, mummy actually don’t agree on cutting her hair now as they are still very short. Daddy has the same opinion too. So, granny cut Elizabeth’s hair without informing mummy. That’s naughty! Granny insisted little Elizabeth’s hair will look thicker by just cutting the hair a little bit shorter and make it like the bob style. So, What is the outcome? Is that true? “Overall, if we cut the baby’s hair a little bit shorter or at least make the hair end at the same length, it will automatically look thicker.” True or Myth? True. Mummy is quite particular about little lizzy’s clothings actually. Even the shirts and pants she wears at home, mummy try to look for cute ones too. What do you think about these pants and shirts? Cute? Lovely? Mummy keep them for CNY. As the weather is so hot here, little Lizzy might need some sleeves less and shorts too. Mummy was attracted by the poker dots pants immediately she saw it. Thus, she bought 2. 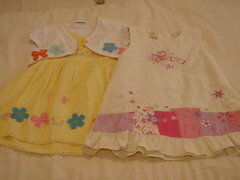 In fact, she wants to buy all the 2 colors but she can’t find the right size for the yellow one. The pink is unique too. It’s like a dress but it’s short. 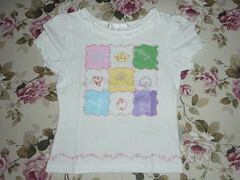 So, it’s such a cute shirts! 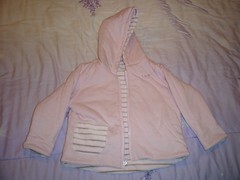 It’s not easy to get the size we want when we are looking for it in a big pool of baby clothes. I guess you already get it. I bought all of these shirts and pants during carnival sales. And, these are the grand sales items. Cheap but good enough just like the cheap hotel Las Vegas. Little Lizzy, your are going to celebrate the 2nd CNY after your birth. 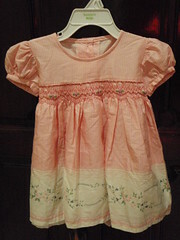 And, mummy is so excited as you learn to appreciate beautiful clothes these days. And, like varieties of food too. Thus, mummy hope you can enjoy this CNY to the fullest. Cute aye? Both are like “can can” dress. The white one with only tiny flowers at the top is from Poney. 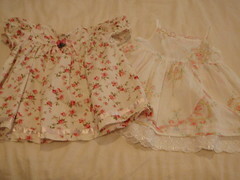 I bought the one which is full of tiny pink roses from a shop called “Studio Seven”. It has all kinds of English kids wear for little girls. Others are all from Penang GAMA Supermarket which I bought during special sales day. But, I can’t recall their brand names at all. So, there are 7 here. And, here’s the last piece. I prefer to shop for her all year long clothings during CNY season. As this is the time all the shops will get in beautiful kids wear for sale. There are more varieties as most parents will spent more on kids wear during New Year. Of course, this will be kept for CNY. This dress fits her nicely. Most importantly, it’s very cheap. 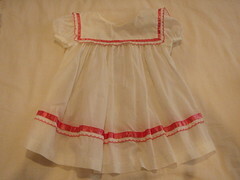 Last week, Mummy bought the other English cotton dress for her. And, it costs RM 80 ( around USD 26). However, this one with almost the same material ( in fact, I prefer this material more as it’s slightly thinner. Just nice for our super hot weather) only cost mummy RM33 (USD 10). What a big difference, isn’t it? Chinese New Year is around the corner. So, it’s time to “show off” Lizzy’s New clothes for CNY now! 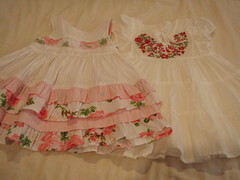 In fact, I have bought many new clothes for her. But, the old ones in the house told me that most important children should wear new pajamas for the might before new year and the night we pray to “Tian Gong”. So, I quickly spare a few pieces of new pajamas for her. Not because of the old believe. But, it’s a great excuse for me to shop for my little princess. 😆 I really loves to shop for her clothes. LOL! 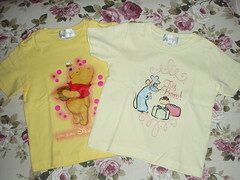 That’s all the shirts mummy bought from Disney. Now there is a problem. Only the white one can fit Elizabeth now. Those 2 yellow shirts will be left aside until she is much bigger. May be around 3? OMG! Mummy always buy something too big. I am sick for the past few days. So no mood to play. However, I start cruising around the house now. And, mummy is not going miss all the wonderful moments during my birthday party. I guess she busy with blogging again. She is going to show you something I am good at now. It’s Kissing. Since my birthday, I kiss my cousins, my grandma, my mum, my dad, my uncle and even “Pooh Pooh”. This new “Winne The Pooh” bag is my favorite birthday present. It’s from my “GuGu” — Uncle Bill. He seems know me well. I like it so much! Thus, I kiss and kiss… and kiss it non stop. Also, this is the first gift he bought using his own hard earn money. He works for 3 days standing in the Shopping Mall as a sales representative before my birthday. And, this gift was bought with his salary. Mummy is proud of him. Like this shoes? I just bought it about a month ago from Tree House, Penang. 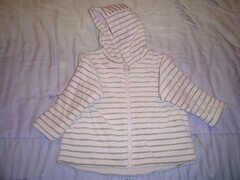 It is so cute and Elizabeth really look so “baby like” when she put it on. I love this design so much. Soft Homemade leader like baby flog. Does this look familiar to you? However, this pair of shoes has no crocodile mark on it. Anyway, the design is still quite similar with that famous rubber flog. Thus, I am quite worried… luckily Elizabeth can’t walk yet, so is still save for her. I guess some mummies already know what am I worried about. If you still do not aware of the danger of wearing the famous rubber flog. You better wake up now, especially if you are still crazy over it. If you are Malaysian(only for Northern region), quickly grab today’s “The Star” newspaper and flip through it. You might see one big bold header stating CAP (Consumer Association of Penang) : Ban Rubber Clogs in the ‘Star Metro” section. If you are too lazy to pick up the newspaper or you are simply a Malaysian who live outside Northern Region or you might from other countries. Check this out, then you will know what I mean. This is specially dedicated to all parents. Your dearest baby girl or boy, or even yourself might be wearing the wrong shoes which you might thought it is a great one. Be caution as you might seriously injured or lost your toes just by wearing a pair of highly praised rubber clog. I might continue to make some updates regarding this topic if there are other serious incidents occurs. 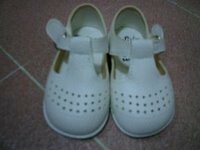 Hope you parents always got the right shoes for your dearest little ones.